For some students, inspiration came from a science teacher’s lesson on the expanding universe. For others, it was reading “To Kill a Mockingbird” for the first time. And for others, it was finding their voice in the school choir. Many famed singers, such as Al Green of Grand Rapids’ former South High School, first discovered their vocal gifts in school choirs. But many more simply found a joy in singing that made them look forward to school each day, and stayed with them for the rest of their lives. Today, School News Network visits two school choirs, whose directors have built strong programs through high standards, public performances and tapping into students’ love of song. The 122 third- and fourth-graders are learning to sing, arriving at school early twice a week and preparing to perform, both for parents and peers in school assemblies and at major events in big venues. Shepard, a choir director for 30 years, has organized performances for his students with well-known singers and adult choirs, at churches, festivals and events, knowing his students will step up to every occasion. They are cooperative and eager to learn, he said. “They don’t have preconceived ideas about how they should sound. They are very willing to try whatever you ask them to try. Therefore you can have very high expectations, and they will rise to those expectations. Shepard has served as Countryside’s director for six years, tapping into students’ natural enjoyment of music. The program has grown steadily from 80 students two years ago to 96 last year. Shepard, who also performs with the Grand Rapids Symphony Chorus, has previously served as choir director at Byron CenterHigh School; at Valleywood Middle School in Kentwood Public Schools; and at Berkley High School, near Detroit. Countryside’s choir has also performed at First United Methodist Church in Grand Rapids, at the school’s annual Veterans Day Assembly, and at Fifth Third Ballpark. 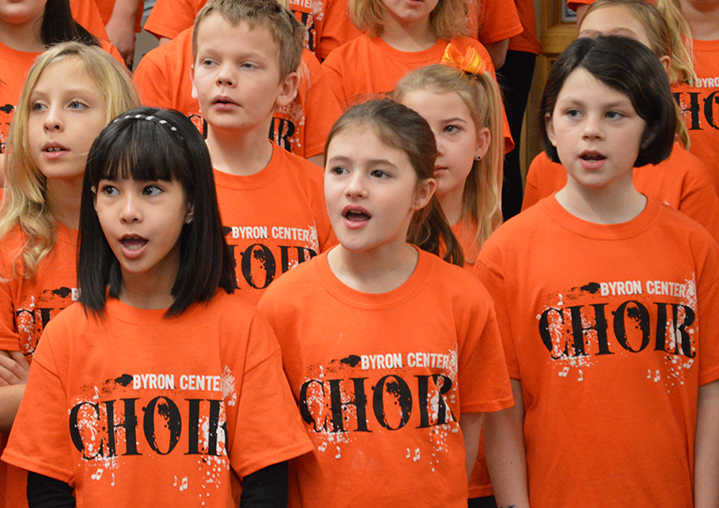 They will join choir students from across the district during the Festival of Voices in April. 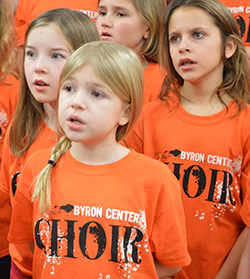 In Byron Center, Brown and Marshall Elementary schools also have strong choir programs, creating a foundation of talented and experienced singers for Nickels Intermediate, West Middle and Byron Center High School. 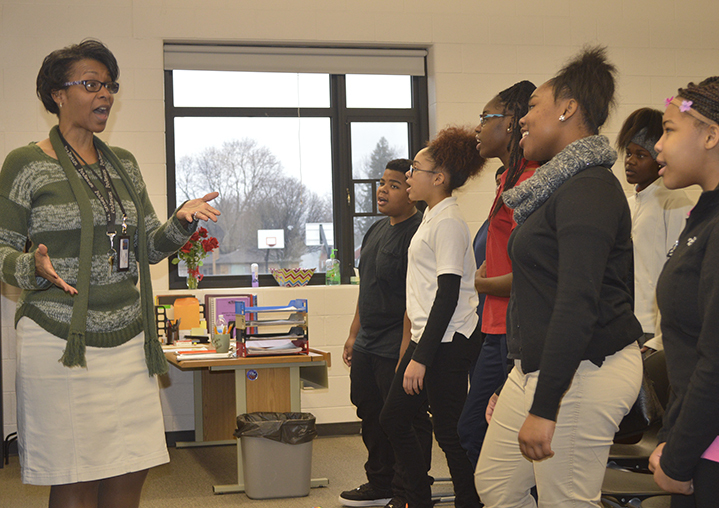 In the choir room of Alger Middle School, Vanessa Allen is swaying side-to-side along with 18 students, singing “I Will Get There” by Boyz II Men over a mellow instrumental track. It’s an inspiring private performance, with students holding their heads high and shoulders squared. They follow Allen’s lead as she reminds them to keep their chins up and mouths oblong. Although they are studying for an exam, the choir members seem to be thoroughly enjoying themselves. Makenzee Powell certainly is. “I just like having fun with everybody,” the eighth-grader says, adding that experiencing different cultures through song is part of the fun. She also likes singing out in the community, and helped to write and record a song about bullying. But she admits she didn’t like choir until this teacher came along. “Miss Allen actually does care, and she makes sure that we’re OK and that we understand,” Makenzee adds. Getting to know her students, and caring about what they care about, are essential to building a strong choir program, says Allen, a 20-year GRPS veteran who also teaches at Martin Luther King Jr. Leadership Academy. She looks for songs she knows students like, and lets them choose some of their own adapted to reworked, positive lyrics, finding that music culturally relevant to students helps them learn and apply vocal techniques. But she mixes those “want-to’s” with “have-to’s,” such as classical pieces and Swahili/English songs. And she is a stickler about “non-negotiables,” such as singing in tune, understanding notation and respecting themselves and others. That philosophy helped her rebuild a first-rate choir program at Ottawa Hills High School, where she taught for 18 years. Her three choirs included the Salt & Pepper Chorale, an audition ensemble that performed in national competitions and in venues ranging from New York and Toronto to Disney World, where they placed third nationally in their category. She has kept that traveling tradition since coming to Alger last school year. Her students sang at the Martin Luther King Day service at New Hope Baptist Church, at a GRPS citywide vocal music spectacular at Ottawa Hills, and for passengers disembarking at Gerald R. Ford International Airport. They will perform at Michigan’s Adventure in May. The fight is worth it, she says, both for the arts’ academic benefits and music’s intrinsic value. “It makes us have empathy for others. It’s a way to express ourselves. … It’s what makes us human.